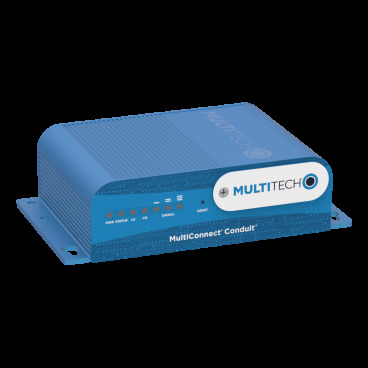 MultiConnect® Conduit™ is the industry’s most configurable, manageable, and scalable cellular communications gateway for industrial IoT applications. Network engineers can remotely configure and optimize their Conduit performance through DeviceHQ®, the world’s first IoT Application Store and Device Management platform. The Conduit features Wi-Fi/Bluetooth/Bluetooth Low Energy (BT/BLE), GNSS, and two accessory card slots that enable users to plug in MultiConnect® mCard™ accessory cards supporting their preferred wired or wireless interface to connect a wide range of assets locally to the gateway. Available options include a LoRaWAN™ mCard capable of supporting thousands of MultiConnect® mDot™ and xDot™ long range RF modules connected to remote sensors or appliances. Both IBM’s Node-RED, a graphical, drag-and-drop interface and mLinux™ Open Embedded/Yocto opens the complex world of IoT application development to a wider user group to monitor and control their assets. Quick-to-deploy and easy to customize and manage, the Conduit communications gateway realizes your IoT application. Wi-Fi communication supporting 802.11 a/b/g/n 2.4 GHz and 5GHz with WPA2 personal transmission security. Wi-Fi Access Point and Client modes are supported simultaneously.